Running Re-Cap and Blueberry Pie Smoothies! Why don’t we start with a discussion concerning the legality of Girl Scouts Thin Mints, shall we? I love them, but once your husband pulls a U-y and digs for change to buy a box- maybe it is time to give them up? No? 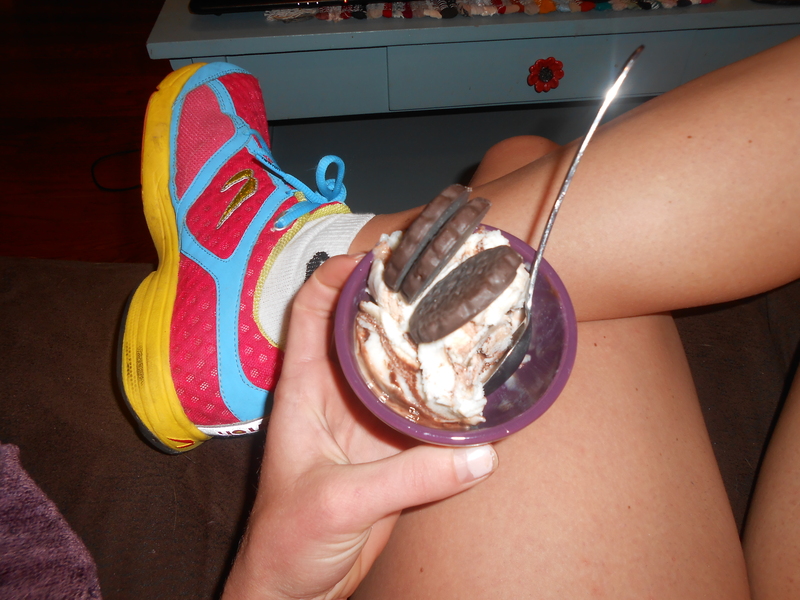 Dessert last night was some Stonyfield Fudge Ripple frozen yogurt with 3 cookies… and one more cookie in the kitchen. Chef’s treat? Last night’s run was 13 miles with 7 in marathon-pace range- I did 3 of the miles at my “b” goal (8 min/miles- which would be good enough, but not ideal)- the 8/min miles felt soooo easy (which is good, because 26.2 miles is a lot of miles in a row)- so I bumped the next for miles of the set up to the 7:30-7:40 pace range. These were also good miles. Weee! I finished up with 3 chill miles at 8:34 pace. Not bad for a Wednesday night! (note- this was a treadmill workout and 2 episodes of Homeland were watched). The entire run felt light and easy, and I finished strong with plenty of gas in the tank- which leaves me confident for longer runs with tempo miles at the end- AND for my upcoming half marathon on February 23rd (Winter Half at the Hamptons- Hampton Beach, NH). Sat. 2/8 – 18.8 miles, 8:30 avg pace- outside, with hills. Felt light and strong. Sun 2/9- 6 miles, no garmin, hilly course, ran easy. Mon 2/10 – 9 miles- 2@8:41, 2@8:20, 3@7:30, 2@ 8:34 (Treadmill)- felt EASY. something is CLICKING!!!! Thurs – 7 miles @8:34. felt tired. Oh wait, I ran 13 miles 12 hours ago. Every Thursday (pretty much)- I run in the morning and make these. They taste like pie. They are easy AND healthy! 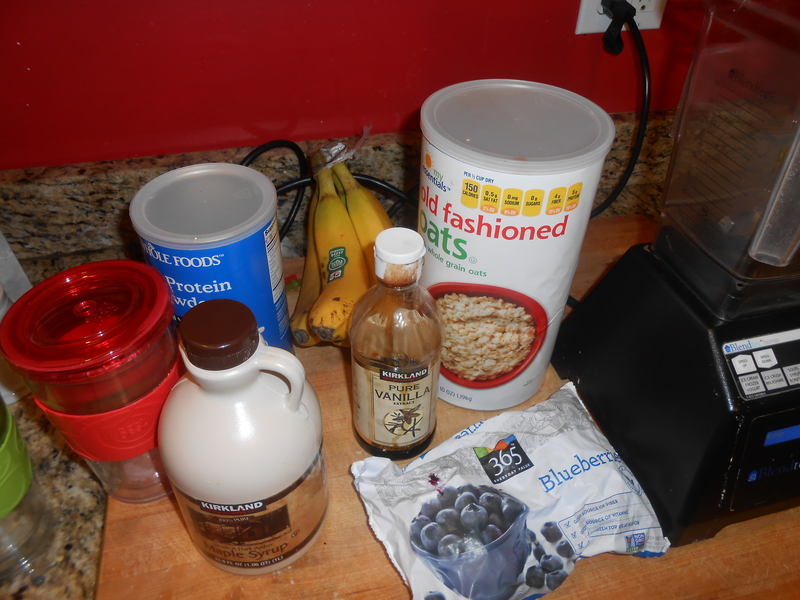 Ingredients- oats, protein powder, a banana, maple syrup, frozen peaches, frozen blueberries, juice of 1/4 lemon, cinnamon, and a dash of vanilla. Also- ice and a little water. I add more ice on the second full blend. I blend mine twice to get it really smooth. Magically, it tastes like pie. 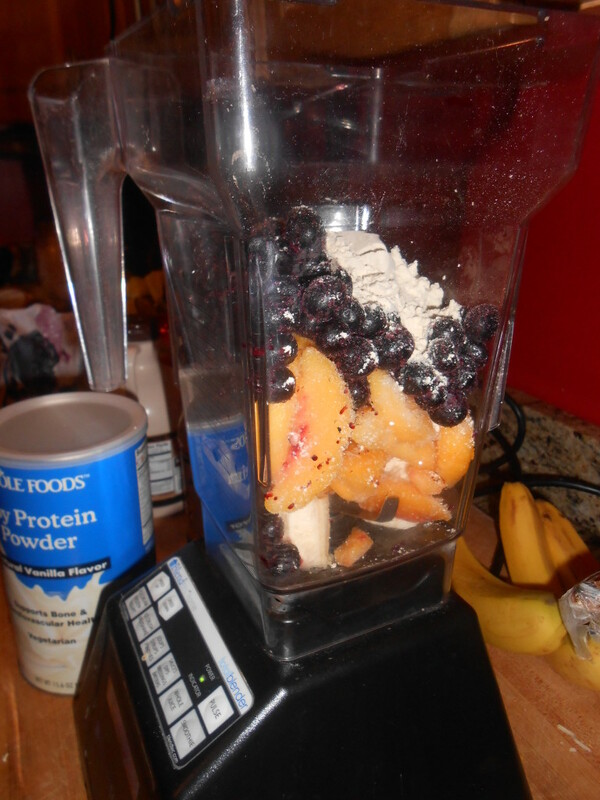 Load up the blender with all of the ingredients- I start with the banana at the bottom so it doesn't seize. 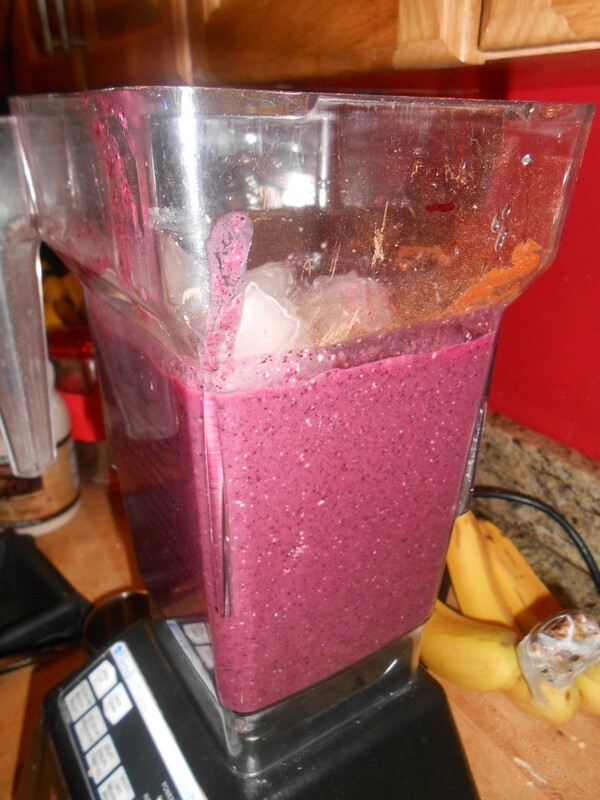 Blend on high (I use my smoothie button). Taste! You can add more maple syrup if it isn't sweet enough. I usually throw in a few extra ice cubes and re-blend another full cycle. ENJOY! This entry was posted in Cooking, Recipes, Workouts. Bookmark the permalink. 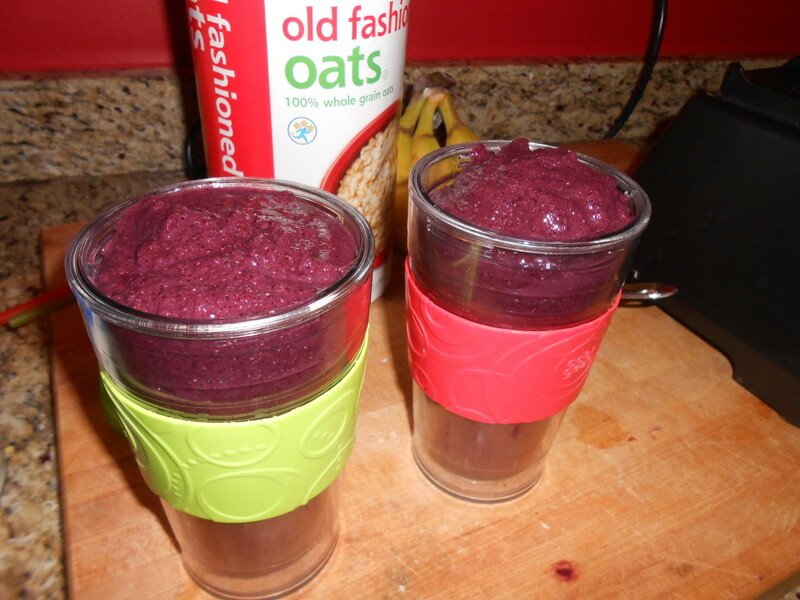 4 Responses to Running Re-Cap and Blueberry Pie Smoothies! We have a Blend-Tec- equivalent to vitamix. Honestly, the blender is so powerful I am a little afraid of it. It took me most of a year to get to a 60 mile week! I have been averaging low 50’s for a while- I am hoping to peak Boston training with about 70 miles. After the marathon I am going to switch to speed work and probably decrease miles to the 40 mpw range. I’m gonna try this smoothie! It looks great! I make a similar one with spinach and yogurt in it but I like the no dairy approach too!